New Package Deal: "Ultimate Red, White & Blue Package!" Memorial day is just around the corner, and 4th of July will be here before you know it! That's why we have just put together this special "Ultimate Red, White & Blue Package Deal!" 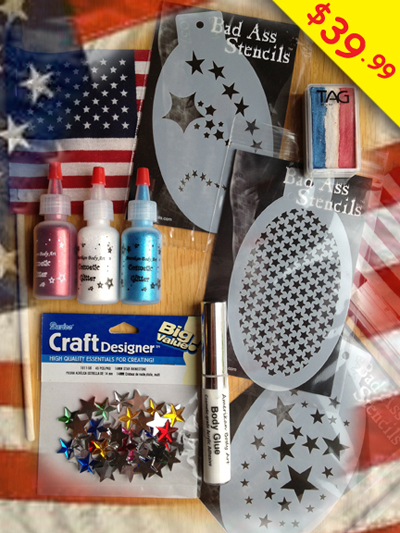 For just $39.99, you get a TAG red, white & blue pearl one-stroke cake, three BAM star pattern stencils, a package of 45 star shaped acrylic rhinestones, a bottle each of Amerikan Body Art cosmetic glitter in red, white, and blue, a tube of Amerikan Body Art Body Glue to adhere them! You save $4.25 versus purchasing everything separately. Order today and you'll have it before Memorial day! 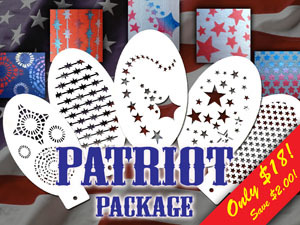 And don't forget, we still have our new BAM Stencil "Patriot Package," which includes 5 awesome stencils for your patriotic parties for $18.00, saving you $2.00! The basic principles here can be applied to really every design you do. The trick to getting it to look real is really just a matter of shadow placement. When I painted this, I was imagining the light source coming from the upper right corner. Any edge or face that faces that corner then gets a highlight, and the opposite edges/corners get shadows. If you are having trouble visualizing it, grab one of your kids' toys and hold it by a direct light source and look where you see highlights and shadows. After all, real life is the best reference for realistic paintings! So for the door I started with just a black line. Next I added highlights with a light flesh color, a little lighter than my skin. Next I added the little depressed area where your finger can catch the battery lid. This was just a half circle with a shadow on the top and highlight on the bottom. Note that if you flipped those, it would appear to be bumping out, not in. This is the importance of shadow/highlight placement! Finally, I added some white "hot spots" on some corners. 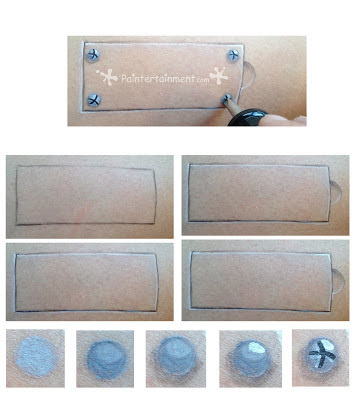 For the screws, I start with a flat gray circle. Next, I pick up just a little Kryolan black and brush on a shadow around the bottom left side of the screw head. 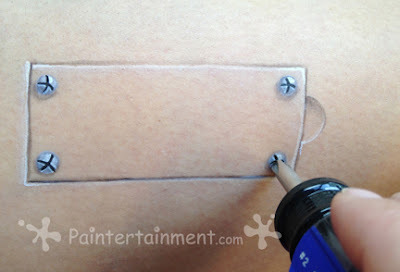 3rd, I'll create the shadow that is cast by the screw onto the skin. 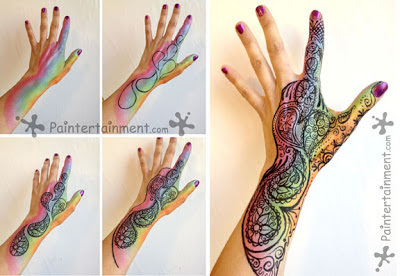 I use Kryolan black for this too. To get a nice, soft, gradual shadow, I will lay down some black first. Then I'll rinse my brush, just get it a little wet, and then carefully scrub the edge of my line to re-activate the paint and feather it out. 4th, I added a hot spot with Wolfe white, and finally, the Phillips head "x" shape with wolfe black. Notice how slightly curving the lines, rather than a straight-on "+" sign, gives it more of an illusion of depth and roundness. I have totally fallen in love with Wolfe black and white, and ALMOST totally replaced my Kryolan with Wolfe. 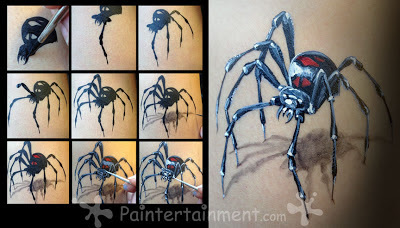 But, I keep my Kryolan black on hand still because it works great for light shadows, like I did here and on my 3-D spider. It behaves a little more like a watercolor paint, enabling you to control the shade, whereas Wolfe seems to be consistently super duper solid black. One of the many reasons you'll see professional painters with several blacks and whites in their kit...different brands do different things! Okay, so this month was the first time I have participated in a little something they call "Tag: You're It" on the Face Paint Forum. Basically what you do is form teams with a list of members, and then each person takes a turn going down the list and "tagging" the next person with a subject matter to paint and then share with photos. My subject: YELLOW! 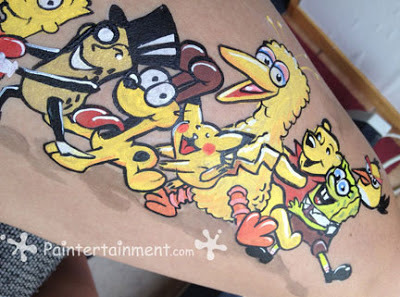 Yeah, I know, I know, I'm going to be thrown in jail for all of this copyright infringement, but let it be known that I have made NO money off of this entirely TEMPORARY artwork done on my own thigh and then photographed and washed off. It was just a fun exercise. 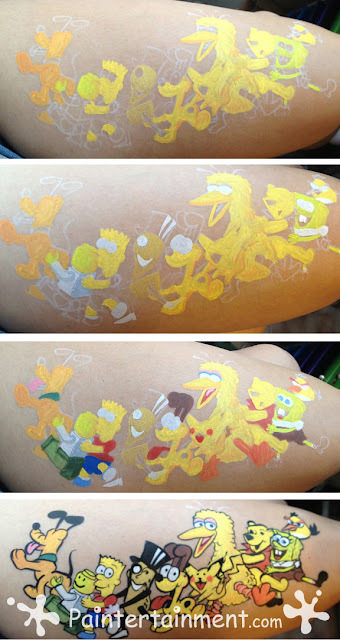 I decided to do a conga line of yellow cartoon characters. ;-) This is why I love things like contests and these "tag" games...they always force me to do something I would never normally have come up with! 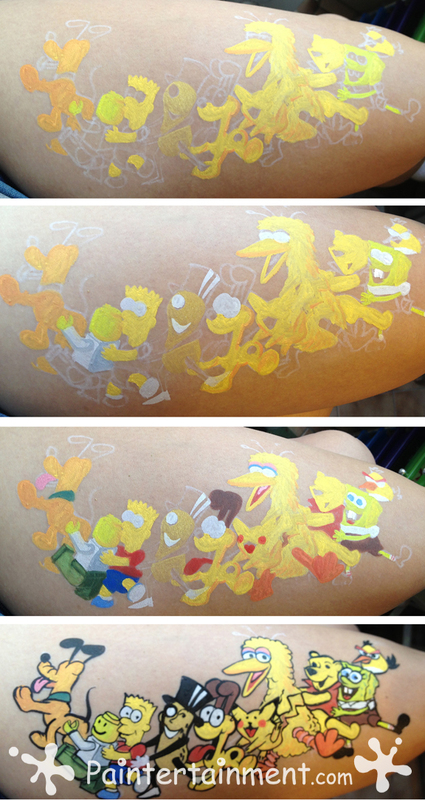 I had more yellow characters on my list, but I ran out of thigh and this also took me almost an hour. When you break it down that's about 5 minutes per character, which is a lot for me as I was really taking my time. Essentially it's a line-up of cheek art that would normally take me 3 minutes or less. 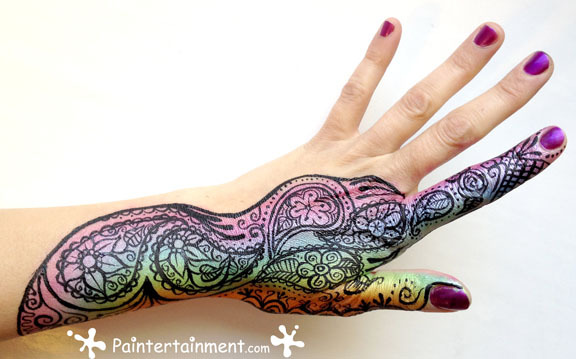 But, I was in no rush painting myself! This was really fun and I hope to be able to jump into the next "Tag: You're It!" Hey everyone! Usually I like to do cartoon-y stuff, but I thought I'd try out my first realistic looking spider today! I've seen some cool ones online over the past few years and love how the shadows can really make them appear to be real. 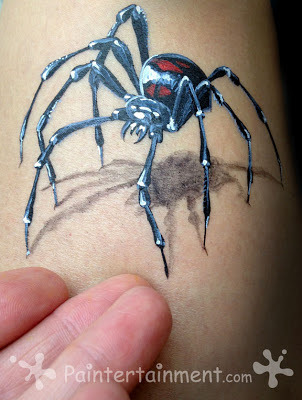 So, I did a Google image search for a black widow and just used that for reference. Here's what I came up with! The segmented legs are really just long, skinny teardrop strokes and really add to the realism I think. I used Wolfe black for the spider itself, because it is SO black, and then used a watered down Kryolan black for the shadow underneath. The whole thing was done with my two favorite Wolfe synthetic brushes, round #1 and round #4, however, it probably could be done with just one of those. I am getting a little fed up with professional face painters who brush off cheek art as being something that only beginners do. 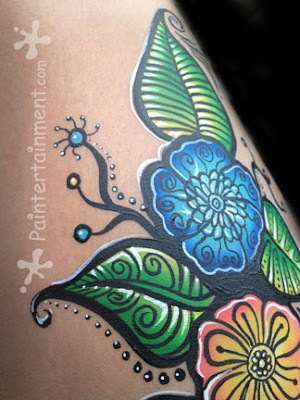 Yes, it is true that many painters start out with simple cheek art, however, that does not make cheek art any less amazing and smile-inducing than full face designs! The ironic thing is, most of the artist I have heard comment on cheek art being beneath them, also end up admitting that they find larger, full-face designs quicker and easier to do because they have less detail and are more forgiving. 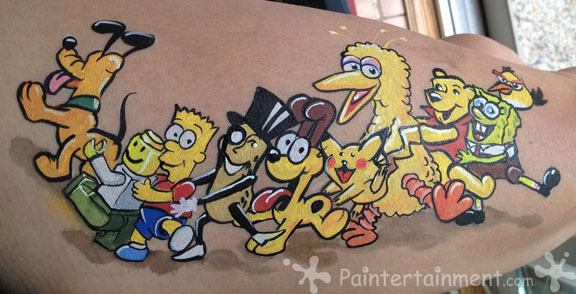 Cheek art can be just as awesome. 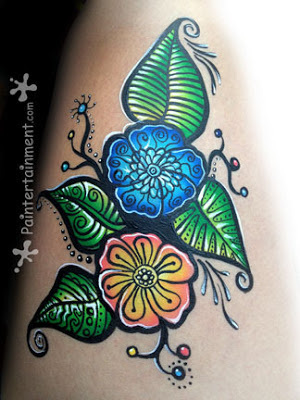 I have personally been doing mostly cheek art for most of my 18+ years of professionally face painting. Over the past few years I have slowly started to introduce full faces into my repertoire. 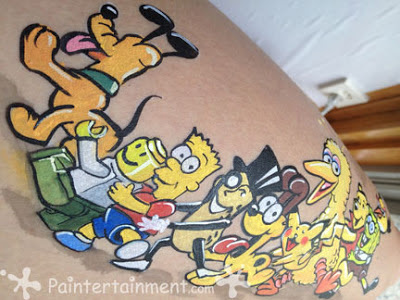 However, creating amazing cheek art still does require artistic talent and great control of the brush and paint, especially when creating recognizable characters with detail. Just about every kid you will come across will have a character they love, and getting that character just right is a talent in itself! As we all know, a kid will be the first one to call out any and all little mistakes we may make in their likeness! 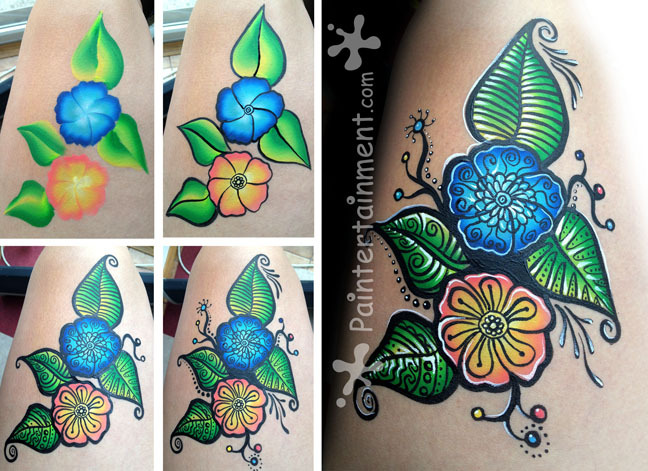 Cheek art is versatile. You can start with super simple images, and add more detail as you get better. You can keep it simple, or elaborate more if you have a child who is wiggly or one that can't sit still. The same art can be created on an arm, a hand, a shoulder, or a leg, without relying on a face. I can't even tell you how many parents have told me how happy they are to find someone doing cheek art, because their child makes a total mess of full face designs when they eat, play, rub their face, scratch their nose, etc. On the flip side, most cheek art designs can also be very easily turned into full face designs!! Simply placing a cheek art design in the center of the forehead and embellishing around it can turn it into a great full face or mask design! 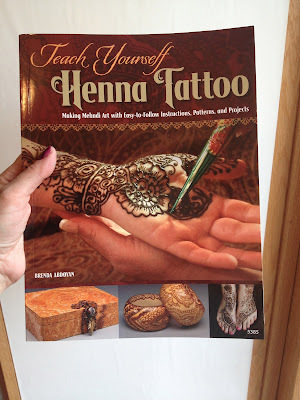 So, please don't write off the inspiration you can draw from cheek art if you are a full-face-only artist! I'm not saying one is any better than the other, however, I think cheek art has been getting a bad rep lately in the professional community. So, for this reason, I have created a new face painting group that focuses on cheek art! This group is open to actual face painters only, just like all of the other face painting related groups I have found and joined on FB, so please don't be offended if I message you asking if you're a face painter when you request to join. I've learned from some other wonderful FB group admins that there are some creepy characters out there and we want to watch out for them! 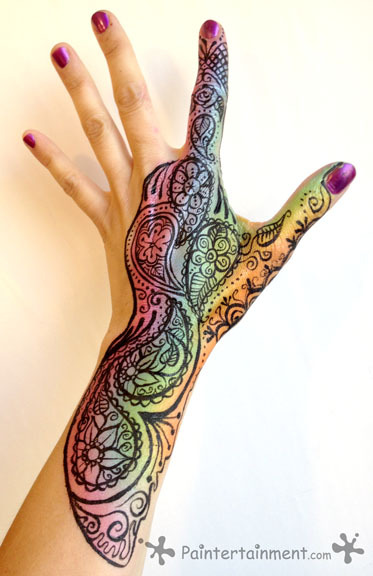 So, if you are a face painter who is interested in cheek art, or would just like to get a little additional inspiration in your news feed, please join us! We'd love to learn and share with you! !